- FrancesCassandra: UK fashion, beauty and lifestyle blog. : Outfit: Summer is Coming! Is it? Is Summer finally coming? I have been waiting for weather like this for what seems like forever- it felt like it was never going to come and the bipolar rainy weather we were having a couple of weeks ago was making me feel so depressed whilst I was tackling the last of my assignments. Alas, the sun has popped his head from behind the clouds, and with me finally being done with university I am definitely making sure I make the most of it! Today, me and my bestest took a stroll down to the park with our cameras to take some summery outdoor photos and I thought I would take the opportunity to show off this playsuit I picked up in the Motel Rocks sale last week. I was never really one for the neon trend, but recently I have found myself attracted to anything bright, tacky and/or loud. I think the fact that this Summer is probably going to be my last before I enter a doomed life of full-time, permanent work (*shudder*) has released a "wild" side in me and I just want to have some fun. 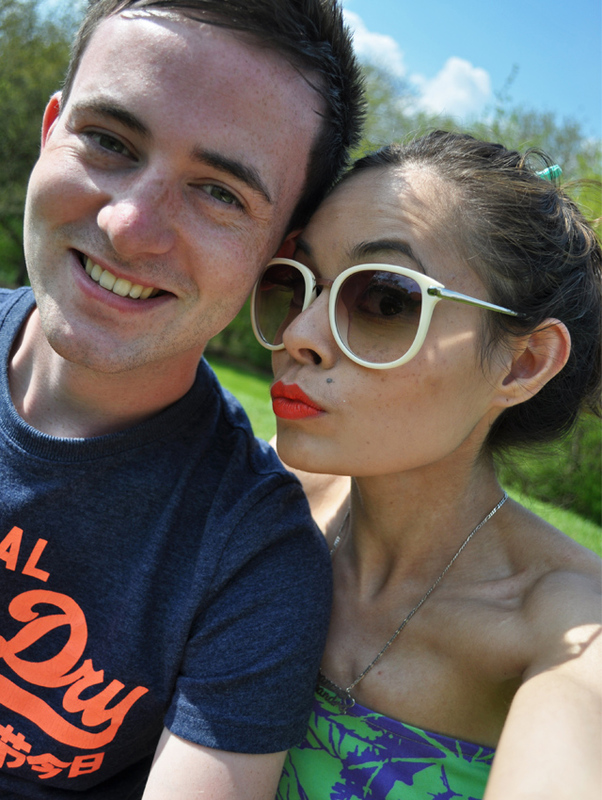 Anyway, I hope you have all been enjoying the beautiful weather, let me know how you spent the Bank Holiday weekend in the comments :) I will leave you here with a photo of my best friend looking very handsome whilst I ruin the photo with my duck face (although I have recently acquired a new love for orange lipstick-what do you think?)! I love your outfit! Suits you so good!